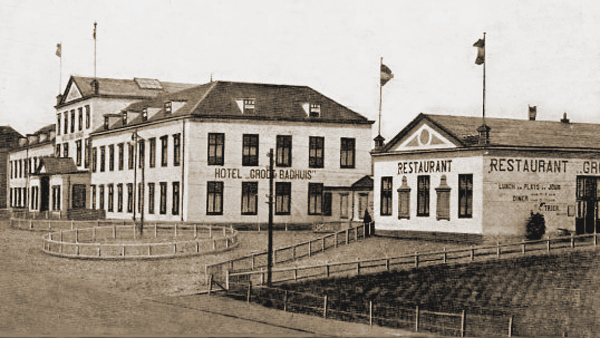 The Hotel Groot Badhuis was built high on the dunes between 1826 and 1828 to a design of T.F. Suys. In the stately, neoclassical style it had 36 rooms and 8 bath houses. The new Zandvoortselaan led to the semicircular parkway in front of the hotel. Zandvoort could now boast of having accommodation of international quality. In 1854 the hotel was enlarged when an extra floor was added to both its north and south wings, providing an extra 60 rooms. In 1866 a Kurzaal, which served as a theatre and conversation room, was also added. A new addition to the north side was erected in 1905, and in 1919 the last large extension to the hotel took place when a third floor was added to the main building. The hotel was pulled down in 1943.